My husband’s favorite breakfast food is breakfast corn dogs. I know, so random. Haha! I thought I would surprise him and make some for him rather than the ones you buy in the frozen section of the grocery store. They were so easy to make and tasted amazing! They had a nice crispy edge, with fluffy blueberry pancake surrounding the sausage. They were even better when we dipped them in maple syrup! 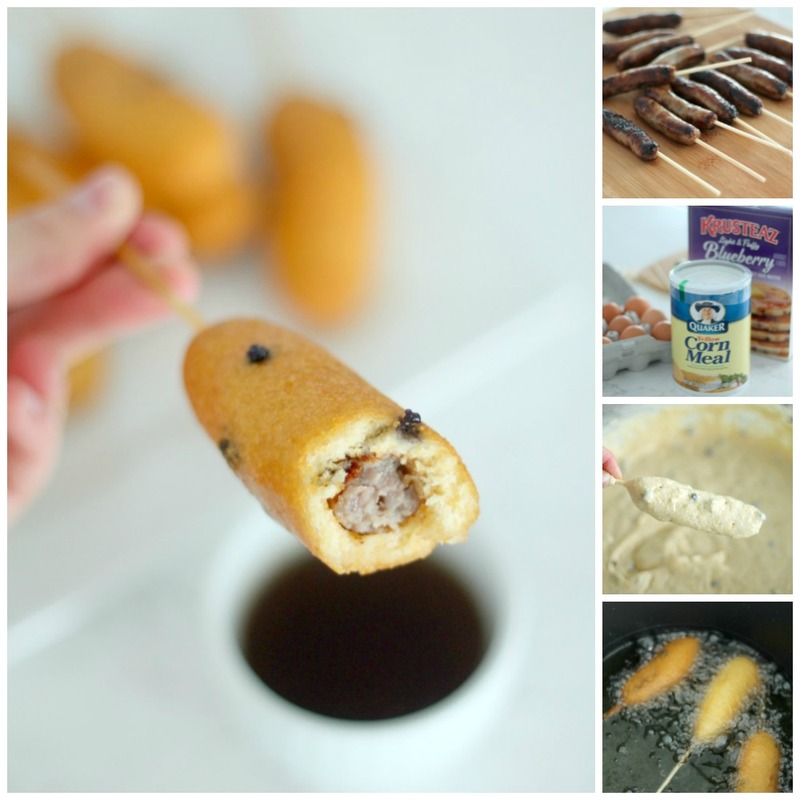 Breakfast sausage dipped in a blueberry pancake batter and fried to golden perfection! Serve with warm maple syrup for the ultimate breakfast. Cook sausage in a frying pan over medium-high heat until cooked through. Pat cooked sausage with paper towels to absorb excess grease and insert a bamboo skewer into each sausage; set aside. In a large bowl, combine pancake mix, cornmeal, and cinnamon. Add egg, vanilla and water, adding more water as needed for the batter to become slightly thick. Start out by adding 1 cup, then work your way up to 3 cups. Heat some canola oil in a large pot over medium-high heat to about 350 degrees F.
Dip each sausage into batter and allow excess to drip off for a few seconds. Carefully drop each battered sausage into oil and use tongs to turn each corndog to ensure even browning. Remove corndogs from oil when the outside is golden brown, about 2 to 3 minutes. Serve with warm maple syrup for dipping. Any chance these could be baked instead of frying? I'm afraid the batter would slide right off if you tried to bake it. Sorry about that. Could they be cooled and frozen for later consumption? These will freeze great in an airtight freezer container or freezer bag.